John Henry Hauberg Jr. was born in 1916 in Rock Island, Illinois. His maternal grandfather, F.C.A. Denkmann, and great uncle, Frederick Weyerhaeuser, had purchased a sawmill on the banks of the Mississippi in 1860. This modest enterprise was the foundation of the Weyerhaeuser Company, a lifelong partnership and family business which continues to this day. Hauberg's father, John Henry Senior, was fascinated by Native American history and crafts and passed on his interest to his son. When Hauberg Jr. moved to Seattle, he became involved with the tribes and individual artists of Western Washington, British Columbia, and Alaska. Part of Hauberg's legacy to the city of Seattle is a stunning collection of Pacific Northwest Coast Indian art that can be seen at the Seattle Art Museum. After serving in World war II Hauberg founded the Pilchuck Tree Farm, a 16,000 acre research tree farm north of Arlington in Snohomish and Skagit Counties. In 1971, Dale Chihuly came to him with a proposal to hold a glassblowing summer workshop on the tree farm. The rest, as they say, is history. In addition to the Pilchuck Glass School, Hauberg was involved with the community in many ways - the Bush School, Reed College, the UW College of Forest Resources, the Seattle Opera, the Seattle Art Museum, the Seattle Symphony, the Pilot School for Handicapped Children, the Child Development and Retardation Center, the American Federation of Art, the American Crafts Council, and the Republican Party, among many others. 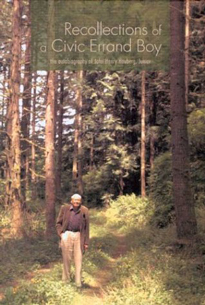 Hauberg's autobiography Recollections of a Civic Errand Boy (2003) chronicles a life of extraordinary generosity to the arts and the musical and educational institutions of Washington State.